“We have seen a rapid and worrying increase,” said the Health Minister. 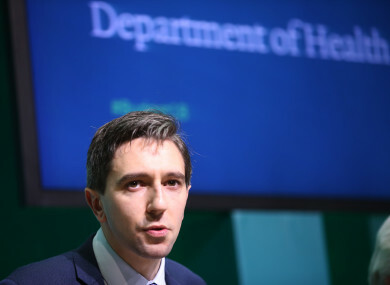 MINISTER FOR HEALTH Simon Harris has declared that the CPE superbug has been declared a public health emergency. CPE - carbapenemase producing enterobacteriaceae – is seen as an emerging threat to human health, particularly in hospital settings. It has developed the ability to become resistant to even the most powerful, last-resort anti-microbial treatments. More than half of all patients who develop blood stream infections with CPE die as a result of their infection, the Department of Health said. Harris said that he was convening the national public health emergency team, as a public health response to the emerging superbug. He said: “We have seen a rapid and worrying increase in the incidence of CPE in Ireland, with a significant increase in numbers of cases of CPE in recent years. Known outbreaks have occurred in eight healthcare facilities in Ireland resulting in high costs and bed closures. There is experience from other countries that a vigorous response in good time can contain CPE and so I am committed to tackling this with the urgency it requires. The Minister added that this emergency team would provide, guidance, support and direction on the surveillance and management of CPE. I have examined this issue, in conjunction with the National Patient Safety Office, and concluded that the patient safety issues are so important that this CPE public health emergency requires a coordinated whole system response. The World Health Organization, and the European Centre for Disease Prevention and Control, identify CPE as a serious threat to patient safety due to the few therapeutic options available to patients. Email “Simon Harris declares a 'public health emergency' for superbug”. Feedback on “Simon Harris declares a 'public health emergency' for superbug”.